Investigating "Active Thermitic Material Discovered in Dust from the 9/11 WTC Catastrophe"
Discussion in '9/11' started by Mick West, Feb 2, 2018. The experience debunking the angle cut column was interesting, as it showed that even though something may well have been debunked sufficiently for most people years ago, that debunking information is often inaccessible and arguable - sometimes buried in discussion threads. The cut column discussion resulted in an inarguable debunk, with accompanying simple graphics. Abstract: We have discovered distinctive red/gray chips in all the samples we have studied of the dust produced by the destruction of the World Trade Center. Examination of four of these samples, collected from separate sites, is reported in this paper. These red/gray chips show marked similarities in all four samples. One sample was collected by a Manhattan resident about ten minutes after the collapse of the second WTC Tower, two the next day, and a fourth about a week later. The properties of these chips were analyzed using optical microscopy, scanning electron microscopy (SEM), X-ray energy dispersive spectroscopy (XEDS), and differential scanning calorimetry (DSC). The red material contains grains approximately 100 nm across which are largely iron oxide, while aluminum is contained in tiny plate-like structures. Separation of components using methyl ethyl ketone demonstrated that elemental aluminum is present. 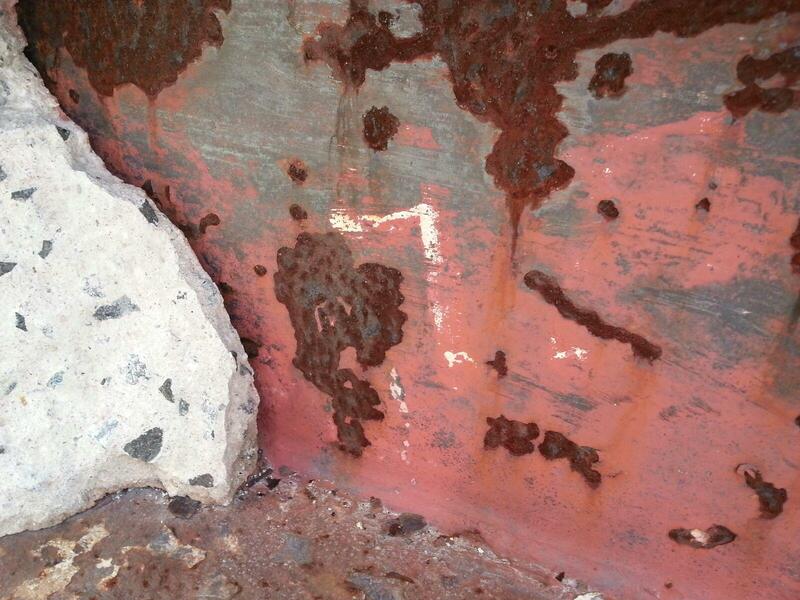 The iron oxide and aluminum are intimately mixed in the red material. When ignited in a DSC device the chips exhibit large but narrow exotherms occurring at approximately 430°C, far below the normal ignition temperature for conventional thermite. Numerous iron-rich spheres are clearly observed in the residue following the ignition of these peculiar red/gray chips. The red portion of these chips is found to be an unreacted thermitic material and highly energetic. I took some steps along this road with the post discussing the misidentification of "abundant manganese" via X-EDS, which taught me a little about the X-EDS process and problems. Jones, it seems, had difficulty correctly interpreting X-EDS back in 2006. Perhaps there were similar errors in the 2009 paper? I recognize this is old ground, however my goal here is to produce a go-to debunk of the paper using past, synthesizing past debunks with any more recent information, and presenting it in an accessible manner. So let's begin by gathering the past debunks, much of which was done deep within the JREF/ISF forum. SE Jones, crawling under the name of Niels Harrit as lead author, published their study "Active thermitic material found..." of red-gray chips in 04/2009 in a pay-to-publish "paper" of Bentham publishers. Within days, debunkers had noticed that the hexagonal platelets in some of the chips is almost certainly kaolin clay, an aluminium silicate, which is essentially inert, of no use in any thermite preparation, and an ingredient of many paints. Also, it was clear almost immediately that the rhomic particles of hematite are simply red pigments - the very thing that makes steel primer paint red. In 2010 or 11, Sunstealer at the JREF forum found an SE Jones presentation with XEDS analysis of actual paint from the external columns of the twin towers - it was a very good match with the red-gray chip from the Bentham paper that they soaked in MEK solvent to, purportedly, show that the aluminium is separate from the silicon - figur 14 in the Bentham paper. That paint ("Tnemec Red") has no aluminium silicate (such as kaolin) in its recipe - and that chip also was no match at all for the chips (figures 6 to 11) that contained the kaolin plates. In summer 2011, the late Czech chemist Ivan Kminek discovered a second, different paint recipe used in the twins: The shop primer of LaClede steel manufacturer, who made the floor trusses. This recipe does contain aluminium silicate, and simulated XEDS charts of that recipe are an excellent match for Harrit's and Jones's figures 6-11! In early 2012, James Millette sent his analysis report of red-gray chips from another batch of WTC dust samples to Chris Mohr of the then JREF/today ISF forum. Clearly, the chips that best matched the Harrit/Jones main chips contain kaolin, hematite pigment, and epoxy binder - just like the LaClede primer. That is the last achievement in this issue so far. Current status: Chips are primer paint - very little doubt. 1. The chips I mentioned do not show a trace of strontium in Millette's analysis, as they ought to, if they are LaCLede primer - the recipe calls for a small amount of strontium chromate primer. However, we know from two of Jones' co-authors, Niels Harrit and Jeff Farrer, that THEY found strontium and chromium! So what I'd like to do is create a simple yet deep summary of the evidence for paint, and present it in a a permanently findable format with nice large graphics, and maybe a short explanatory video. Second image is from Harrit, with a spectra overlaid and scaled. I've always wanted some red/grey chips of my own, and it turns out I had them all along. So, I hit it with a hammer. Collected a bunch of flakes. Lots of rust, but some chips of paint. It's a red/grey chip, and I've got a wheelbarrow full of them! 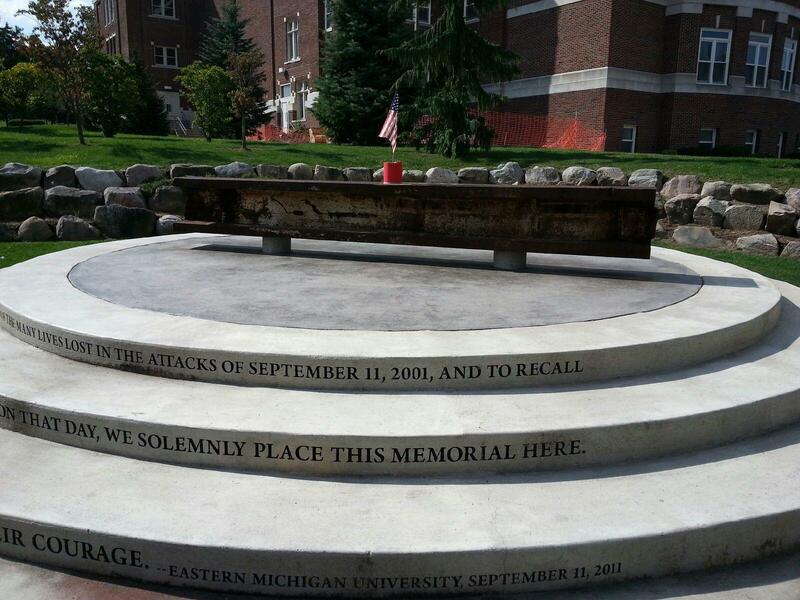 sorry to interrupt.. are ae911 saying these truss things are literally covered in thermite? Here's a scale comparison with the Harrit microspheres (left) and mine (right). Of note, in both their photos and mine the red layer appears undamaged. Curious, since that's supposed to be the one that's nanothermite. What seems to have happened is the iron oxide layer has "burnt" (perhaps with some of the paint, of some intermediate layer), and created some iron microspheres. Added a 50 micron blue line. The range of sizes of shiny microsphere is very similar to those in the Harrit paper. Again, unburnt paint, molten iron. I am away this weekend and only checking a few sites before nodding off to sleep. Do not conflate the topic "what are these chips" with "what are they not" or "are they thermitic". There are several grave problems with Harrit et al that render their conclusion "thermite" untenable and ridiculous, with no need to come up with a different concusion. I love however your micrographs!!! Agreed, however it's also good to have a reasonable alternative explanation, even if it can't be proven 100%. This image above shows how they were mangled in the fall, and this is probably one of the more pristine examples. Here's a specification for the paint used. Paint. Is there anything on the market I can get a can of that's a close match? Can I mix it from other things? Steel. What should I apply it to? A piece of A36 uncoated steel sheeting? How to clean the surface? Application. Presumably spray-on? What does "bake" mean? Heat the steel to 350°F before or after application? How to get it 1 mil (1/1000") thick? Aging. How long should I leave it? Should I simulate any weathering, heating cooling cycles? Flaking. How do I make flakes? Bend the steel? Hit it with a sledgehammer? Heat it? All three, and more? Testing. Beyond heating the flakes, checking for magnetism, and looking at them under a microscope, wha tother tests can I do to see if they match (or don't match) tests done on WTC dust flakes by Harrit, et al? the ULN and ULC fire test facilities. B50NV12 is the red one, B50NV11 is grey. In June 2007, Dr. Steven Jones observed distinctive bi-layered chips, with both a red and a gray layer, in a sample of the WTC dust. Initially, it was suspected these might be dried paint chips, but after closer inspection and testing, it was shown that this was not the case. Red/gray chips were soaked in methyl ethyl ketone (MEK) for 55 hours with frequent agitation and subsequently dried in air over several days. The chips showed significant swelling of the red layer, but with no apparent dissolution. In marked contrast, paint chips softened and partly dissolved when similarly soaked in MEK. Therefore tests were also performed with a small oxyacetylene flame applied to red/gray chips. Samples were either heated on a graphite block (Fig.22) or held with tweezers in the flame. Several paint samples were also tested and in each case, the paint sample was immediately reduced to fragile ashes by the hot flame. This was not the case, however, with any of the red/gray chips from the World Trade Center dust. 7. Could the Red Chip Material be Ordinary Paint? where R = resistance (ohms); A = cross-sectional area (m2); L = thickness (m). Given the small size of the red chip, about 0.5 mm x 0.5 mm, we used two probes and obtained a rough value of approximately 10 ohm-m. This is several orders of magnitude less than paint coatings we found tabulated which are typically over 10^10 ohm-m .
Another test, described above, involved subjection of red chips to methyl ethyl ketone solvent for tens of hours, with agitation. The red material did swell but did not dissolve, and a hard silicon-rich matrix remained after this procedure. On the other hand, paint samples in the same exposure to MEK solvent became limp and showed significant dissolution, as expected since MEK is a paint solvent. Further, we have shown that the red material contains both elemental aluminum and iron oxide, the ingredients of thermite, in interesting configuration and intimate mixing in the surviving chips (see Results, section 1). The species are small (e.g., the iron oxide grains are roughly 100 nm across) in a matrix including silicon and carbon, suggesting a super-thermite composite. Red chips when ignited produce very high temperatures even now, several years after the 9/11 tragedy, as shown by the bright flash observed and the production of molten iron-rich spheres (see photomicrographs in Fig. (20) above). Correspondingly, the DSC tests demonstrate the release of high enthalpy, actually exceeding that of pure thermite. Furthermore, the energy is released over a short period of time, shown by the narrowness of the peak in Fig. (29). The post-DSC-test residue contains microspheres in which the iron exceeds the oxygen content, implying that at least some of the iron oxide has been reduced in the reaction. If a paint were devised that incorporated these very energetic materials, it would be highly dangerous when dry and most unlikely to receive regulatory approval for building use. To merit consideration, any assertion that a prosaic substance such as paint could match the characteristics we have described would have to be accompanied by empirical demonstration using a sample of the proposed material, including SEM/XEDS and DSC analyses. So it seems they tested at least for Zinc ferrite corrosion protection paint. However, as their data shows and as @Oystein correctly mentioned, they probably should have tested it against paint containing aluminium silicates. They have no mention that they used such. It may have been an acceptable replacement in NIST's fire test, but may be of rather limited value for comparison with Harrit's chips. Better go searching for a recipe that has epoxy binder and also some kaolin. I wonder if electrodeposition of paint is at all responsible for the two layers? (red and grey). It seems like this would be a tricky process to duplicate in my garage. To fully understand the benefits of electrocoating,it is necessary to understand the mechanics of the process. We use gray oxide primer carefully balanced with resins, pigments and corrosion inhibiting agents. As processed, resins are water insoluble and must be converted chemically into salts that are easily dispersed in the water. In electrocoating, our tanks are filled with this water dispersion of paint. The paint particles have a negative surface charge due to the salt formation. The structural members to be painted are connected to the positive side of a powerful DC power supply, giving them a positive charge. The tank itself is wired to the negative side of the power source. When the power supply is activated, the current flows from the negatively charged tank to the positively charged structural steel, causing the negatively charged paint particles to migrate to the steel and be plated to the surface. During this plating process, taking one to two minutes, electrochemical reactions take place on the surface of the structural parts, changing the salts in the paint back to their original acid state. The voltages involved (200-300 VDC) act as a kind of electronic pressure to densify the resin, resulting in a paint film not only water insoluble, but virtually 100% solid. After coating, the parts are baked in an oven, converting the paint films to an enamel composition that is hard, abrasive resistant and it’s with this process, superior corrosion resistance is achieved. It would also seem like this process would explain some of the physical and chemical differences between red/grey WTC chips, and just "paint"
Is it possible that Laclede might have used a two stage coating process? A grey oxide layer then a red oxide/pigment layer? If you look at electrocoating in automobile manufacturing they use multiple layers. So this question is answered by the above. Not spray on, and baked AFTER the electrodeposition. So by electrodeposition they mean the following process, where the paint is in solution, and the object completely dipped into it? The possibility of forming of simple low-cost multilayers in many different systems, e.g. Cu/Ni, Ni/Ni–P etc. So it seems there is no advantage listed from "electrochemical reactions" as cited above, besides the densification of the paint (which is equal to 'free from porosity' I suppose). For I interpret the electrochemical reaction they mention there as simply the hydrolysis of the salt into an acid and a base (on different electrodes), or just having the acid fall out and leaving the solution basic. I would first spray it with an air spray without electrostatic charging simply. Does the Spray-Applied Fire Resistive Material (SFRM) play any role here? My poor wheelbarrow is taking a bit of a pounding in an attempt to make some flakes. I suspect it is electrocoated, as it's sure hard to get anything off it. ... Is it possible that Laclede might have used a two stage coating process? A grey oxide layer then a red oxide/pigment layer? If you look at electrocoating in automobile manufacturing they use multiple layers. First, we have the specification, and it specifies only one paint. Secondly, NIST did not think two layers were applied or needed. Thirdly, the SEM and EDS work by Harrit/Jones/Farrer and also Millette shows the gray layer as iron/iron oxide with bits of carbon, manganese, silicon - a composition consistent with structural steel - which is solid and homogenous, quite different from the epoxy+pigments red layer. blasting prior to painting (Sec. 602.100). We only have the specification of the Laclede paint, but it looks like there's also a possible "PPG red power primer RF-2184 replenishing material"? This is pretty clear IMO: The steel was to be painted with one paint: A red chromate paint. This paint was specified to adhere (either) to the PPG company standard OR to the LaClede in-house standard. It may be possible that some proportion of the steel trusses was painted with the PPG paint instead of the LaClede paint, but there is no mention whatsoever of two layers, or any gray paint. Certainly Tnemec Primer has been mentioned repeatedly in discussions and I have certainly seen discussion that there was likely more than one different primer on chips. Millette was not given access to Harrit's chips so had to match by xeds data. He discarded chips that didn't match.Harrit apparently had at least one with different primer. It is of course hard to tell as Harrit's details are a little sloppy. In the paper there are 4 samples mentioned 1. Mckinlay, 2 . Delassio 3. Intermont and 4. White. Then XEDS spectra are shown a,b, c& d apparently corresponding to 1 through 4 but on DSC tests there are 2 Mckinlay samples and no Delassio so these appear to be different chips. Also the peaks are lower for the 2 Mckinlay samples on the DSC and on XEDS chip c shows elements not found in the other 3. The paint had no real function other than to make the steel look nice and new. It is sometimes called a holding primer or a works primer. The steel after erection is in an internal environment so there is no risk of corrosion. 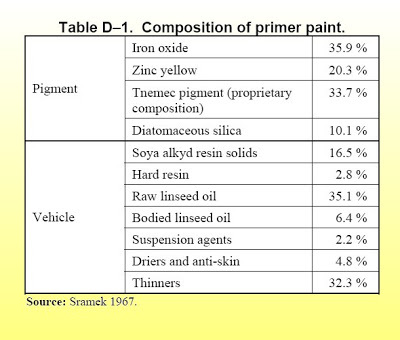 Red oxide primers are still used today. I would expect that the bar hoist floors would be made at a different location to the heavy steel columns. And it would be probable/possible to have a different paint supplier and even a different composition. If it is a big job there may be multiple fabrication centres all of whom would have there own version of a red chromate primer. It is not an important part of the work and as such there is less control on the outputs. It would be very unusual to have more than one coat since you are not trying to provide corrosion protection you are only trying to provide a uniform coating. Of course painting bar joists is quite difficult, as is fire protecting them, and you may need multiple passes to get a uniform surface. Certainly Tnemec Primer has been mentioned repeatedly in discussions and I have certainly seen discussion that there was likely more than one different primer on chips. Millette was not given access to Harrit's chips so had to match by xeds data. He discarded chips that didn't match.Harrit apparently had at least one with different primer. It is of course hard to tell as Harrit's details are a little sloppy. Material 1 - the 4 chips analysed in Figures 5-11 - has a red layer with only the elements C, O, Si, Al and Fe in more than trace amounts (they also have traces of Cr, Sr, Na, Ti and others), with the extra property that Al and Si appear in roughly equal amounts (nearly equal peak hights, which in this case of elements that are neighbors in the periodic table translates quite directly to amounts). Material 2 - the chip analysed in Figures 12-18, which has been subjected to MEK solvent - additionally contains Zn and Mg, and very likely Ca. Material 6 (and likely 7) are evidenced when the text body says that they found chips with significant Cu and Ba, neither which any of the other materials contain. It is not clear whether Cu and Ba were found within the same specimens, or in different specimens. It is of course spurious to extend findings on one material to any or all of the others. This alone renders the paper worthless. In the paper there are 4 samples mentioned 1. Mckinlay, 2 . Delassio 3. Intermont and 4. White. Then XEDS spectra are shown a,b, c& d apparently corresponding to 1 through 4 but on DSC tests there are 2 Mckinlay samples and no Delassio so these appear to be different chips. Also the peaks are lower for the 2 Mckinlay samples on the DSC and on XEDS chip c shows elements not found in the other 3. Yes, correct, the 4 chips represented in the DSC data of Figure 19 are a set different from the 4 chips represented in the SE/BSE/XEDS data of Figures 5-11. It is unlear which of the six materials listed above are represented by which DS curve, if any. It is spurious to lump together the DSC data and the XEDS data, as it is not clear at all they were won from the same material(s). This alone renders the paper worthless. Do not confuse yourself too much by focussing on the identity of the four dust samples. Each dust samples could contain any and all primer paints that were released into the total dust. If you look at two chips, it matters little if they came from the same or from two different samples. As for the DSC data, I would want to point out that they use NONE of the numbers to form their conclusions! They only look at one quality: That there is an exotherm peak. Somewhere. Of some height. There is no analysis, no discussion of the peak temperature or peak power. There is nothing about the value "425 °C" that makes the conclusion "thermite" likely or even compelling. In Figure 29 they compare one of their DSC traces with one trace of actual, experimental nano-thermite. Not only are peak temperature and peak power very different; the curves have MANY differences, and nothing of significance in common, except that both show an exotherm reaction. Which is d'uh. What's worse: The four traces in Figure 19 are not very similar, except for the peak temperature. The black and the green curve are somewhat similar, and the red and blue share similarities, but the latter two are much different from the former two. It is perfectly clear that peak temperature and power are dominated by the combustion of the organic matrix. Many organic polymers burn in the vicinity of 400 °C or slightly beyond. One such polymer is epoxy (or epoxies - there exist various). In fact, the blue and red curve have properties reminiscent of epoxy. Harrit et al note themselves that the specific energy they measured with the DSC data (1.5/3/4.5/7.5 kJ/g) is, in some cases, more than what thermite could possibly do, and they conclude, correctly, that "some" of that energy comes from the matrix. They fail to consider that perhaps ALL of the exotherm comes from burning organics. Since the gray layer is iron oxide and thus more or less inert - as Harrit et al themselves admit -, but also denser than the gray layer, it follows that the gray layer adds mass, but no energy, to the DSC power flow. Specific energy of the red layer alone must thus be conjectured to be twice or more the values presented. This raises a huge problem: It can be computed that 90% and more of the energy MUST come from the organics, and <10% only could theoretically come from a thermite reaction. This means immediately that the DSC peaks are organic combustion peaks. There is no additional thermite peak. It just doesn't happen. The trusses were painted in the factory to protect them from the elements during transport, storage and constrution. Yes, and more importantly: Has been used for decades, if not millenia. Red oxide pigment is sub-miron sized - i.e. nano-scale - and has been for decades, if not millenia. It is not a high-tech product. Yes, this is true. The WTC steel ame from half a dozen or more different steel manufacturers: I remember Pittsburgh Steel for part of the exterior columns, LaClede Steel for the floor trusses. Some other company provided the rest of the exterior columns, two or so companies shared in providing core columns, and then you have steel in the foundations and elsewhere, for which yet other companies were contracted. And indeed, different paints were specified: The floor trusses (LaClede) were specified as LaClede's shop primer - epoxy matrix, iron oxide, aluminium silicate, strontium chromate. The exterior colums were to be painted with Tnemec Red 69 or 99, which is alkyd resin with linseed oil, and pigments of iron oxide, zinc chromate, plus talc, silica and calcium aluminates. We do not know what paint(s) were specified for the core columns. We do not know what was specified for WTC7. No doubt other paints were used. Specification demanded that the steel be cleaned before painting. I am in no confusion as to the worthlessness of the Harrit paper. I just mentioned there was definitely more than one paint sample and the general sloppiness of the Harrit paper. As you mentioned, not only do the DSC samples not match each other, but when compared to the Tillotsen Xerogel Nanothermite it is not even close. The Nanothermite peak is way lower, starts at a much higher temperature and is in fact ENDOTHERMIC until about 380 degrees C.
Fossil flour [Diatomaceous silica/earth]is an opacifier constituted essentially by silicon dioxide, aluminum oxide, iron oxide and other impurities. It is added to paint to give it an opaque finish and a rough feel when dry, so as to provide grip for subsequent spray-on fireproofing. The dried resinous and oily base might be the organic matrix that constitutes the base of the red layer, which is rich in carbon and, as shown, may have a primary role in the release of energy during the combustion process. In practice, the red layer of the wafers identified by the researchers contains exactly the same elements that we now know were present in the corrosion-resistant coating used during the construction of the World Trade Center, including the organic base constituted by linseed oil and alkyd resin. It's not just a matter of the same chemical elements being present. The presence of fossil flour in the paint, too, is compatible with the porosity observed in the samples of the red layer. If one considers, moreover, that mica is also often present in fossil flour, then the presence of laminar particles mixed with crystalline particles of iron oxide might also be explained. The gray layer, which as noted is rich in iron and oxygen, might be linked to a green corrosion-proofing paint (Tnemec Green Metal Primer^, page 303), used extensively to provide markings on steel and explicitly listed in the materials supply specifications, or to a bonding agent used during construction to fix thermal insulation and soundproofing elements. Could this type of paint peel off, forming the small flakes found in Ground Zero dust? The speculation about the gray layer being "linked to a green corrosion-proofing paint (Tnemec Green Metal Primer, page 303)" is almost certainly false in most instances of red-gray chips. These are essentially Fe and O only - the peaks for C indicate a small percentage, consistent with carbon steel. (a), (b) and (d) also have small but unlabeled signals at 5.9 keV - that's the K-alpha level of manganese. And of course manganese is part of most of the structural steel alloys used at the WTC. The gray layer generally is oxidized structural steel. There is no hint of any other element at least in these four specimens, and thus no hint of, e.g., green pigments, or any other pigments, really. No zinc, no chromium, no lead, no copper, no nothing. These shells have organic structures and would stand out under a microscope of fitting magnification! Harrit et al show the micro-structures of the red paint layers of only four chips, and they have specifically selected these four chips foor their very similar properties. There is no diatomaceous silica in these red layers. The reason is simple: These four chips are LaClede shop primer on floor truss steel; and the LaClede paint recipe has no silica. Diatomaceous silica is specified for Tnemec Red 99 - to be painted on the perimeter panels. Harrit et al are looking at a chip of Tnemec 99, in Figures 12-18, but surprisingly failed to include an image of the microstructure. One might suspect that they took micrographs in ranges of 1 to 100 µg, but consciously decided against showing them, because they would contain diatom shells, but no hexagonal kaolin platelets so typical for chips (a) to (d). Some more paint chips from my wheelbarrow. 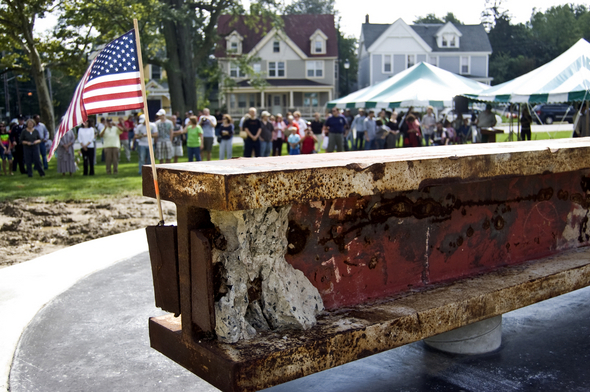 This is a "beam" (probably a section of a column, based on the thickness of the steel) from the World Trade Center site, in Ypsilanti, MI. It strikes me as a good potential source of paint chips for comparison. You would not probably need to scrape any off, just swipe a medium strength magnet over the bottom. It might not be that useful, as the rusting is probably not typical. Like my wheelbarrow chips, the oxide layer is more orange than the cleaner chips seen in WTC dust, which partly formed with more mechanical assistance.